Tumblr gives you a platform on which to build great-looking websites for your photography studio, creative agency, fashion business, florist store, scrapbooking blog and small and medium businesses. There is a host of minimalist Tumblr Themes that you can use for showcasing images related to your business or interest. The following premium Tumblr themes have vintage appeal that can create beautiful websites with a retro feel and without clutter. They also come with modern effects for a smooth and seamless visitor experience. 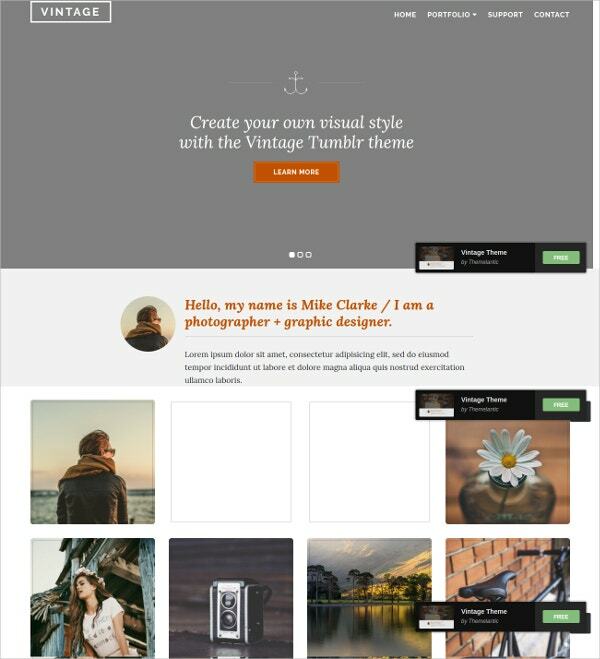 Vintage by Themelantic is a beautiful and Free Tumblr Theme with a classy color scheme and layout. You can personalize your Tumblr with elements like custom logo and let viewers enjoy seamless infinite scrolling. The theme also lets you add a large slider where you can highlight special photos, products, links etc. and customize them. Zeppelin is a simple retro-style template that has a great two column layout and supports all the standard Tumblr post formats. 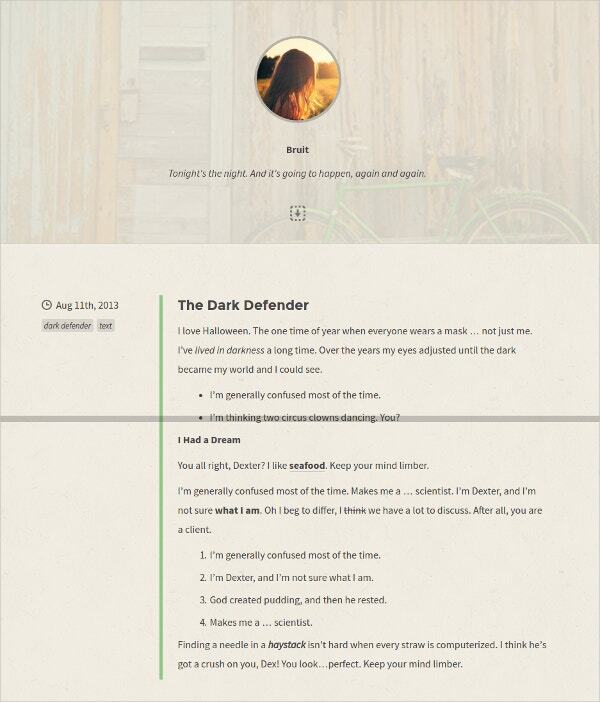 You can also add custom pages and custom CSS for a fully personalized Tumblr. The theme supports Google Analytics, so you can monitor visitor behavior. Other features include social link support, Ask Me support, Disqus comments and more. Bruit is a retro theme with a simple, bright and responsive layout. It is easily customizable and written with HTML5 and CSS3. It is a modern theme with HidPI graphics, so it is retina ready and looks great on all devices. The theme comes with support for custom pages. You can also add custom CSS elements and Disqus comments. 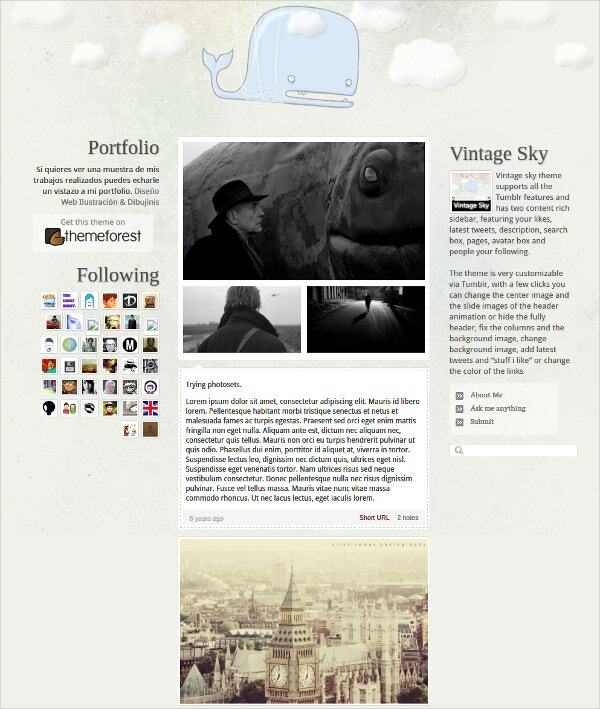 Vintage Sky is a quirky vintage theme with a whimsical animated header. Other features of the theme include two sidebars where you can embed search boxes, latest tweets, likes, descriptions, avatar box, pages and more. If you don’t want to use the animated header, you can choose to hide it as well. 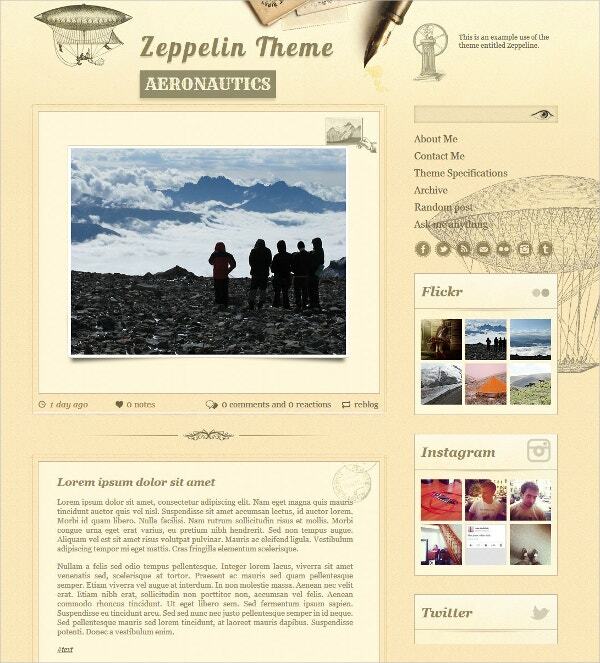 The theme can be customized with a few clicks. Tumblr’s simple post formats makes it seem as if there is not a lot of flexibility when it comes to building a Tumblr. However, premium template designers make it easy to redesign unique Tumblr websites buid around their templates. From Floral Tumblr Themes to retro tones and palettes, there are a lot of options out there.